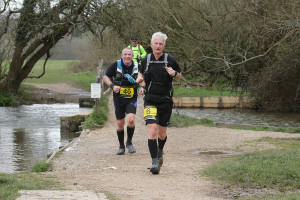 Paul Blundell reports, "Mark Lee and myself decided to enter the Test Way Ultra 44 organised by Andover trail runners. The plan was to use watches for navigation but Mark took a map along also as reviews from last year suggested the navigation wasn't simple, the route sent to us didn't seem to follow the Test Way very accurately and Mark found another track on the web which seemed to have similar problems but I had run some parts of the route on the test way relay races several years ago so was quite confident on not doing any "bonus miles". The Coach to Coombe Gibbet firstly missed the turning and had to turn back and then could not get through the narrow lanes so we had a nice warm up of about a mile to get to the start and free tea/coffee. It was a bit exposed and cold so it was with some relief we finally set off with some 70 others at 9am. I felt we were running a bit quick so kept trying to rein the pace back but as were chatting away, we kept increasing the pace again. My normal ultra strategy is to walk the hills but there were not many of these so we probably ran far to much at this stage. The route was well marked by the council test way arrows and signs the organiser had put out the day before, he cycled it and found it very hard. Cp1 at 10 miles came up quite quickly and was well stocked with lots of nibbles and friendly marshals. Major road crossings were marshalled and the race was very well organised. Pressing on we passed David and Jeremy's houses at Forton but were on a roll so just kept going. Just after the bridge at Wherwell and Mark took a tumble but only pride hurt, so we soldiered on to the White Lion at Wherwell and Check point 2 at mile 21. Mark said he felt OK but I was feeling quite tired and my ruck sack was chafing so plaster on more antichafe cream and off we went . I used to live in Chilbolton so running across the common and out to the Mayfly was a trip down memory lane-sorry about that Mark. We crossed under the Stockbridge/Andover road by the Mayfly pub which did look tempting and then out of the breeze in weak sunshine, we started to feel pretty hot and uncomfortable along the old railway track to Mottisfont via Stockbridge. I suggested a regime of walk breaks to keep the food and drink going through and eventually we got off the railway line to hell, through some sodden fields and up to Checkpoint 3 at around 31 miles. A longer break of around 10 minutes and off we walked shoving down food from the well stocked checkpoint. A mile later the mud started and both feeling pretty tired, this was not a fun section, and indeed mud and waterlogged fields and some frequent stiles were pretty much a feature until the finish. No wonder the organiser had struggled on his bike the day before. We had slowed a lot and not just because of the ground conditions and it seemed to take so long to reach Romsey, and cross the road to more mud. My gpx track had said the route was 43.1 miles long but when we reached the final checkpoint at 41 miles, they told us there was "just" a bit over 3 miles to go. My shoulders were sore, legs tired, and with some painful chafing, it seemed a long way but we carried on with a walk/ jog pace, through more mud and over the boardwalk to the finish in about 9 hours 30, 6:30 in the evening. My watch recorded 44.5 miles. Sitting at the finish I felt tired and thirsty so into the Salmon Leap for 2 pints of Guinness and the free food, I started to feel a lot better." The contents of this site are ï¿½ Hardley Runners unless otherwise stated.